Am calling this design by Magdalena Briner Eby "Lititz Hens". Sorry more hasn't been accomplished on it since the last posting, but such is life. In case you are a new visitor, the dimensions of this pattern is 19 1/2 x 40. 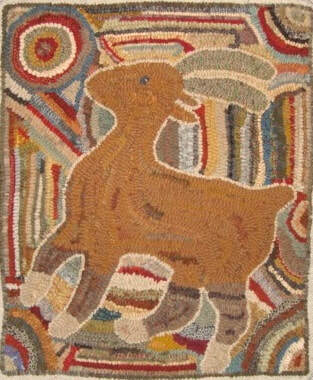 Neither this rug nor Magdalena's Goat, previously hooked by me, appear in this book. 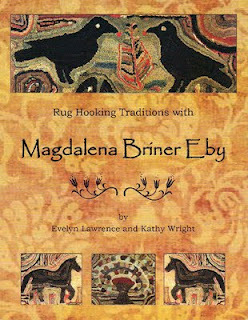 But if this isn't on your rug hooking book shelves it should be. If you wish to order a copy you can contact Kathy Wright HERE. If you missed Magdalena's Goat I hooked this the original size (29 x 35) which was close to colors Magdalena used to hook hers. And this smaller size of 22 x 26 was hooked in different colors just to give prospective hookers color ideas. Okay, with the 'such is life' comment above, I was without heat for 24 hours. Being a 'glass half full' type of person, am thankful the temps weren't those of the previous week. Last week with soaring winds and temperature in the teens it could have been much worse. Thankfully it is warm now and getting ready to have a bowl of chili to warm my insides as well. Happy Saturday. You're really coming along! Love seeing the progress. And so glad your heat is back. My cup tends to be half empty so I would have been quite upset. Good for you! No heat. Not good. UGH. So happy it is back on. no heat is the worst you just can not get comfortable. Wonderful rug, love the darker design against the lighter background. No heat is no fun, the gas company had a problem in Newport and they have not had heat all week and way too cold for that. Makes me think I need to make sure my space heater is working, just in case, never think I might lose the gas. Ohhh, that would not be good at all! Glad u got it fixed! We lost power a few tears back in a storm for 36 hours! So glad we have propane fireplace,,, kept the chill away,,,, but not great when power off everything else!